The curse has descended upon our family again. I used to be able to walk pass the rows of kiddy rides en-route to the supermarket to do my grocery shopping. However as Roy blossoms from a baby to a toddler the colourful and musical coin operated rides are getting too tempting for him to pass without attempting to get on for a ride. These rides comes in all sorts and sizes with ever popular Barney, Sesame street, Bob the builder, Wiggles ,Thomas the train characters attached on them. Capitvated by the pint sized cars, trains, helicopters that he sees neatly placed in a row outside the shops, Roy’s eyes light up and he tried to wiggle out of the restrains of the pram. Luckily Roy has yet to figure out that these machines require coins to activate and he is happy just being placed inside and madly turning the steering wheel. 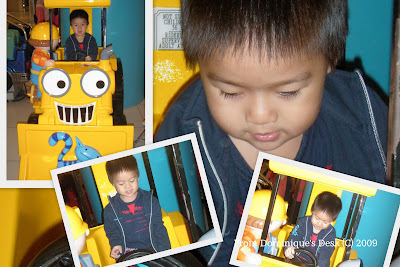 I remember when Ryan was around this age, he too was mad over such rides and still now. Being smarter and wiser now he knows that if he asks his doting grandparents instead of me for small change. He realised that there is a higher chance of him getting the money needed for the ride if he approached the “correct” person with his request. Now I have to figure out how to ” peacefully ” tear Roy away from these rides so that we can get a move on home before the ice-cream starts to melt after we completed our grocery shopping. Any suggestions?